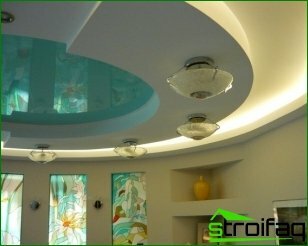 Lighting plays an important role inthe interior. Today to them are put forward higher requirements, and the designers are not limited to their main function - to create the right lighting. Chandeliers, sconces, spotlights, etc. 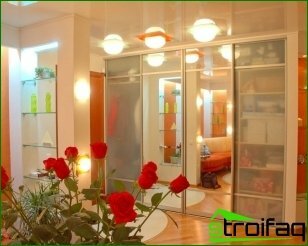 It plays an important role in the design of the room. 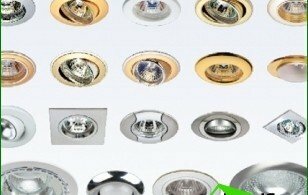 Having considered main types of lampsYou can read their features that will help achieve the desired results in the design of the room. 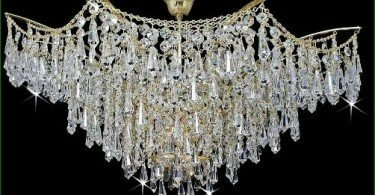 Chandeliers are called suspended ceilinglamps, which in its design have a large number of lamps. Today it is the most common type of devices used to illuminate the apartments. At its core, the chandelier - a household lamp that gives diffused light. In most cases lamps comprise lamps 3-6, and their thickness per 10 sq.m It should be about 150 watts. Modern chandeliers usually involvethe use of decorative light bulbs. Due to their weight and size of the chandelier are significantly reduced. When choosing a chandelier, pay attention to the location of lampshades and lamps. Chandeliers, lamps that sent the cap down, and they turned to the ceiling ceiling its opening directed main stream of light in the ceiling, from which comes its reflection and dispersion. This type of chandelier used to create a diffuse and indirect lighting. Ceiling diffusers are easily mounted to the ceiling andIt requires little space for installation. 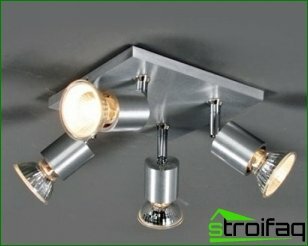 They are ideal for illuminating small size premises: hallway, kitchen, bathroom and loggia. 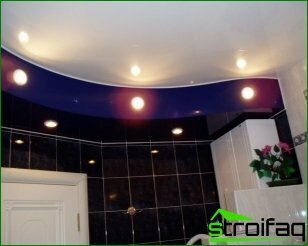 The bathroom ceiling geometry used, which are protected against ingress of moisture. Choosing a bowl with an incandescent lamp is important to consider the following law: one lamp produces more light output than a few tubes with the same total capacity. The main disadvantage is the need for lampshades disassembly to replace the bulb. To do this, you just need to remove the glass from the frame and perform the replacement. These items use the lamp lightingfilament as a light source. They are used to produce scattered light in small spaces. Odnolampovye pendant lights can often be adjusted to the desired height of the backlight, so they are ideal for local lighting. They may have a cover which would be open at the bottom or top. There are times when hanging lamp looks like a lantern, having a seasoned art style. This type finds application in suspendedceilings, and often they are a mandatory part of their. 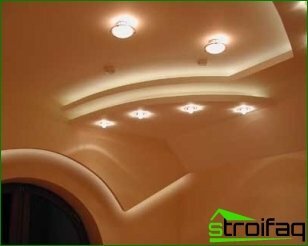 Their peculiarity is that such light sources may be installed anywhere ceiling. They use a fluorescent lamp. With built-in panel lamp cancreate direct lighting, which is directed down from the ceiling. Because of this feature to create uniformity in the luminance are not used alone, but in some quantity at the room. Panel lamp looks like a box with a lid made of transparent plastic. The name of the spotlights received duetheir small size and direct local lighting. Thanks to them, the light fills only a small portion of the surface. They are widely used in stretch and suspended ceilings, niches, furniture, and they are turning unturning. Swivel spotlights are movablethe inside of the valve, while the angle of the lamp allows you to direct the flow of light in the desired direction. The light source used in them or halogen lamps or incandescent lamps, covered with a reflective mirror layer. Such devices will look good in the light and dark ceilings, creating the effect of a higher ceiling and increasing bulk facilities. 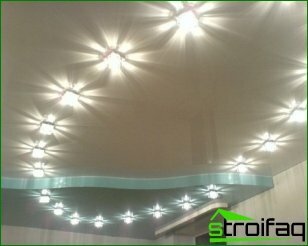 Spotlights can be constructedopen incandescent or have a protective cover. In wet areas, they can be used only if the degree of IP protection. If they have a mobile design, then because of their clothespin can be mounted on a cord or a ledge. Many administrative and residential buildings are chandeliers the main type of ceiling lights. By its design execution of their choicequite diverse. The simplest types are a simple form and modest design. They assume a constant direction of light. In cases where the main flow is directed downwards, whereas area is under the lights, well lit, others are part of the room is not so bright highlights. If the flow of light is directed at the ceiling, it is reflected from it and scattered around the room.